Buzz for the 2012 Experiment. 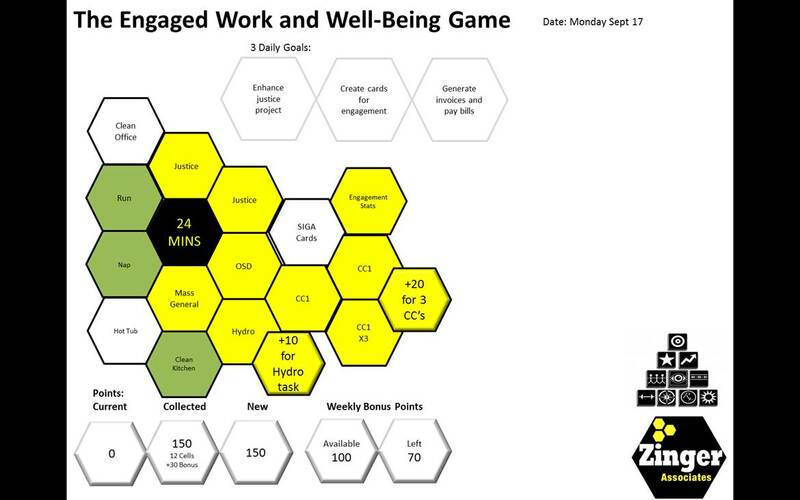 I have been playing with engagement, gamification, work, and well-being this year. I still have 3 months to go but I thought I would let readers know about the success I have been experiencing by creating a low tech game to increase my work accomplishment and enhance my overall well-being. 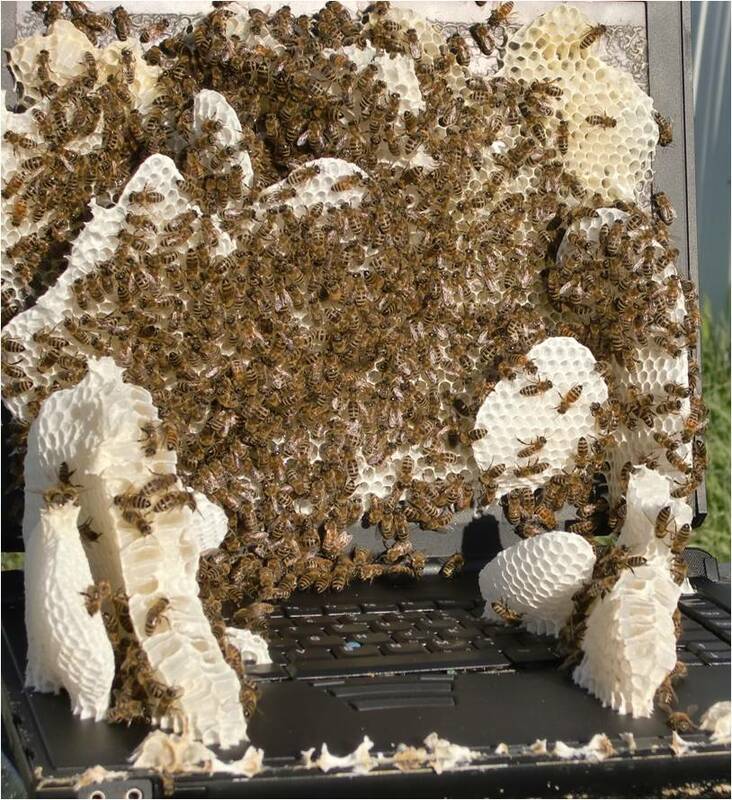 Of course, given my love for the ways honeybees work it is based on the visual of honeycomb construction. 24 minute cells. One mechanism I am using to enhance my thinking, work, and well-being is to chunk my work or well-being periods into 24 minute cells. I find that I can sustain better engagement and thinking, there is a quick end in sight, I gather energy by shifting to other tasks with the next 24 minutes, and I experience an engaging sense of progress. It is amazing what you can think of and accomplish in 24 minutes, and using multiple 24 minute blocks each day builds a strong sustained experience of accomplishment and progress. I have gone game for better thinking, work, and well-being. I have made a game out of my work and well-being. Each 24 minute cell completed is worth 10 points. I work to achieve 400 points each week. There are 100 bonus points available each week to turbocharge my work or well-being on challenging tasks. At the start of the day I determine my 3 daily goals and put the task I will work on in at least 6 cells. As each 24 minute period is completed I color the cell yellow for work and green for well-being. Work and well-being ratios. My overall ratio of work to well-being is 2 cells of work for 1 cell of well-being from Monday to Friday. On the weekend I reverse this to 2 cells of well-being for 1 cell of work. The collected points at the end of specific period of time (often 2 or 3 months) is redeemed by me to make a charitable donation so that the game goes beyond myself and additional meaning is attached to the completion of each cell. Game platform. The platform for the game is very simple, I use a PowerPoint slide for each day and I have a weekly slide to set goals for the week and monitor progress from the previous week. At the end of the year or early in 2013 I will offer greater detail on how to construct and play this game to enhance your work and well-being while also collecting points to trigger charitable donations. David Zinger is a global employee engagement expert who applied principles of engagement and games to enhance his personal work and well-being.